Figure 1. Two sides of the Sloan point from the Sloan site. 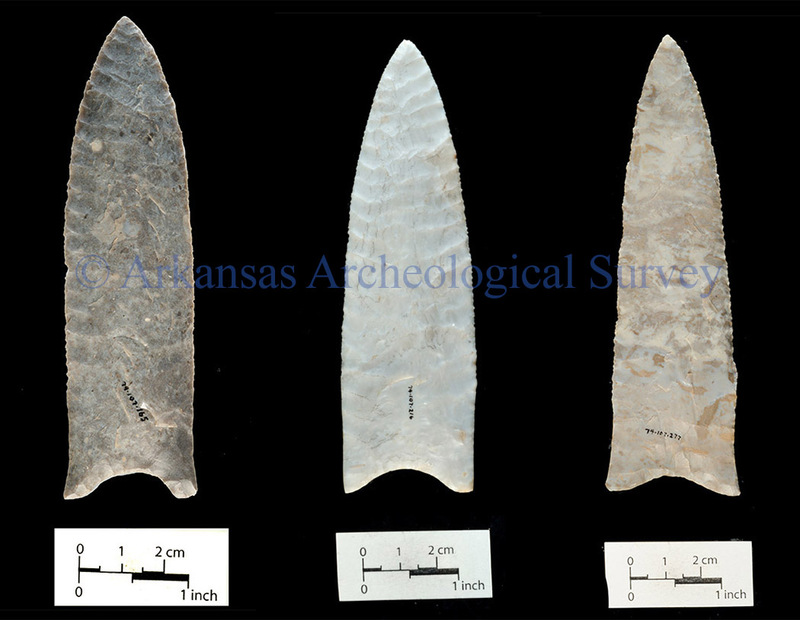 Copyright Arkansas Archeological Survey. Do not reproduce without permission. A Sloan point is a large, thin, bifacially flaked tool made by people of the Dalton archeological culture, which dates to about 12,500 to 11,500 years ago. The heartland of the Dalton culture extends from central Illinois to northeast Arkansas and from the piedmont of the Carolinas to central Oklahoma, but Sloan points have been found primarily in states bordering the Mississippi River. 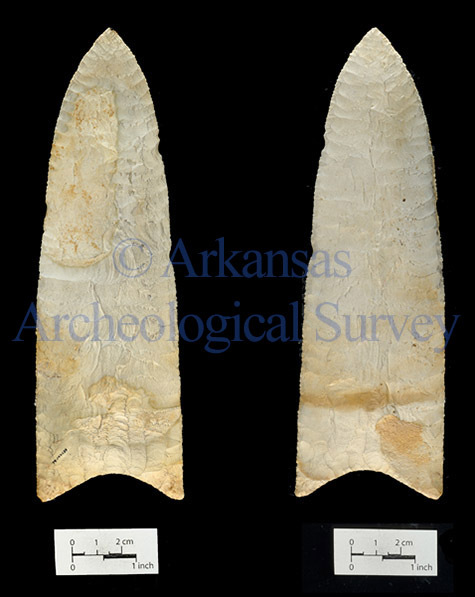 The first professionally excavated Sloan point was found by the Arkansas Archeological Survey at the Sloan Dalton cemetery (3GE94) in Greene County, Arkansas in 1974, giving the artifact its name (see Figure 1). The Sloan site, now owned by The Archaeological Conservancy is the oldest known open-air cemetery in the New World. The Sloan point from this world famous site is the widest and longest Dalton biface from the Sloan site assemblage. It is 189.2 mm long, 59.1 mm wide, and 11.1 mm thick. Sloan points are not simply large Dalton points; they are unusually large or “hypertrophic” hafted bifaces that probably had symbolic meaning. Sloan points are much wider and longer than the average Dalton point and their overall outline shape is parallel-sided to sub-triangular. The basal concavity is comparatively shallow and the flaking pattern is typically collateral (side by side) to the midline of the biface. They resemble some smaller Dalton points in their overall shape and flaking pattern (see Figures 2–5). Figure 2. Pitkin & Burlington Daltons. Copyright Arkansas Archeological Survey. Do not reproduce without permission. At least two dozen other Sloan points have been found in the Central Mississippi Valley. Most of them are made of white chert that may derive from the Burlington Formation. Dalton people may have preferred Burlington chert because of its color, high quality, and knappability (the ease with which it could be chipped to a desired shape), but my research shows Dalton knappers may have preferred white cherts because they occur in large piece sizes. Highly mobile hunter-gatherers selected large piece sizes to make large tools because they have longer use-lives. When large tools break, the fragments can be recycled into new tools. Large tools are like an insurance policy. For Dalton groups scattered widely across the landscape, large tools would be better than small tools because of the uncertainties involved in obtaining flint. Sloan points may be a material expression of the notion that Dalton groups could rely on each other in hard times. We know from the archeological record that Dalton foragers gathered, perhaps annually, at special places. Sloan points and hypertrophic Early Archaic period bifaces have been recovered at these sites. Sloan points, as well as other very large bifaces, have traditionally been regarded as ceremonial objects but in addition to any ritual purposes they served, it’s possible that they were also useful tools. If they were used, either by Dalton people themselves, or by others, we don’t yet know for what specific tasks. None of the reported Sloan points exhibit impact fractures so they probably didn’t function as spear points. Bones of cervids (elk and deer), fish, and birds recovered from several Dalton sites indicate people were hunting and fishing. Easily processed plant foods like nuts and berries were probably also part of the Dalton diet based on the few professionally excavated Dalton sites where samples of floral and faunal remains were carefully excavated. It’s unlikely, however, that Sloan points were needed to process any of these foods. One of the reasons why I think Sloan points were possibly used as knives is based on a study I conducted in 2010. I designed a series of experiments using replicated Dalton bifacially hafted points on a variety of animal tissues (bone, skin, flesh) to create use-wear that might approximate patterns observed on the Sloan Dalton points. I compared use-wear traces on the replicas to Sloan site archeological points, including the large Sloan point, using a low power microscope (40x to 130x). On the Sloan point I observed polish on the lower portion or haft area as well as rounded and polished lateral margins of the biface blade. Another reason why I think Sloan points could have functioned as knives are three probable Sloan point fragments that show evidence of knife wear, but not necessarily by the Dalton people who made them. These large point fragments were donated to the Survey by collectors. Figures 3–5. Other Daltons from the Sloan site. 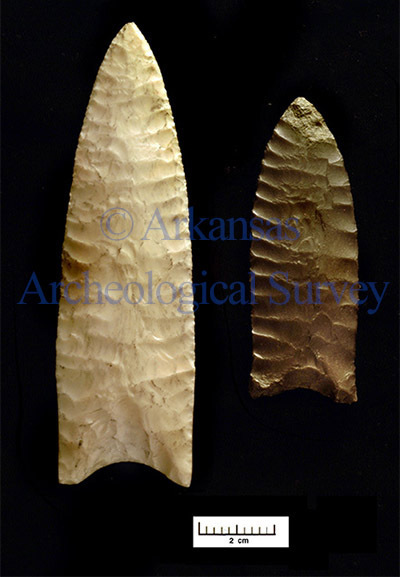 Copyright Arkansas Archeological Survey. Do not reproduce without permission. 2016 Clovis Evidence for Paleoindian Spirituality and Ritual Behavior: Large Thin Bifaces and Other Sacred Objects from Clovis and Other Late Pleistocene-Early Holocene Cultural Contexts. In Research, Preservation, Communication: Honoring Thomas J. Green on His Retirement from the Arkansas Archeological Survey, edited by Mary Beth Trubitt, pp. 18–65. Research Series No. 67. Arkansas Archeological Survey, Fayetteville. 1985 Selected Preforms, Points and Knives of the North American Indians. Volume 1. Points and Barbs Press. Idabel, Oklahoma. 2018 Sloan: A Paleoindian Dalton Cemetery. University of Arkansas Press, Fayetteville. Reprint. Originally published in 1997 by Smithsonian Institution Press, Washington, D.C.